When we last left Hell's Kitchen, things were definitely heating up. We got our first glimpse at the elusive Mr. Fisk, and we saw Matt continue on his quest to find him. How will things proceed? Let's find out... But before we do, a couple of necessary warnings. 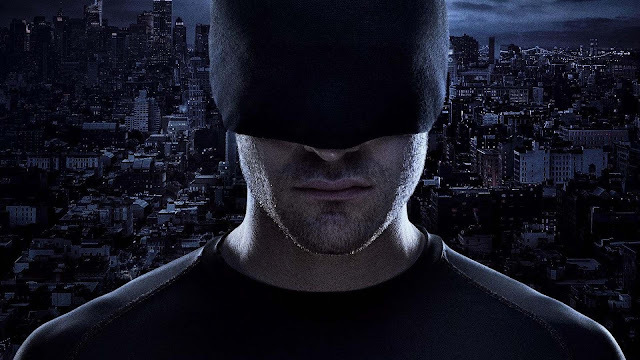 Daredevil has mature content, and there will be spoilers. With that in mind, let's get started. A man is dragged through the hall of a prison and put in a cell. He’s joining another man, saying that it’s just them now, implying one of their comrades has died. The other man replies, “Soon it’ll be just you, Vladimir.” Vladimir says they’ll both be getting out of there,because he has made a knife from the rib of their other cellmate. He breaks off a rib to make another one. Matt is battling these two Russian brothers, Anatoly and Vladimir, and he's clearly winning. A body crashes onto the taxi, shoved off of a roof by Matt. Cut to opening credits, which are just as wonderful as the last time I watched them. When we return from the opening credits, Claire is stitching Matt up and asking how things have been going in the world of vigilante-ism. The guy Matt threw off the roof is in a coma, Claire says, and asks how Matt feels about it. Matt says he’ll live. Claire is at an apartment, house sitting, but there’s a cat and she’s allergic to it. Matt says she should stay there until he’s sure the Russians aren’t looking for her. Claire points out that he’s the one who looks like he’s worse off than she is and that he should get some kind of body armor. Matt refuses, saying it’d slow him down too much, which is probably true. His fighting style is versatile, blocky, and steadfast, not conducive to body armor. In response, Claire says a bullet will slow him down. Matt: “You worried about me? Claire says it’s dangerous for Matt to come by unannounced since guests of hers could see him, so Matt tells her to give him her number and he’ll call next time he needs to come by. Claire says he needs to ease up on the crime fighting. 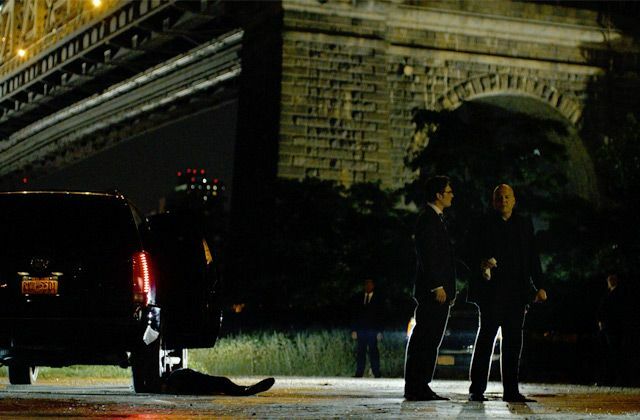 Matt says he can’t and starts to tell her about Wilson Fisk. He was given the name by someone (the guy from the last episode that impaled himself), and that there’s no public record of Fisk anywhere. Claire thinks that the guy was lying and gave him the wrong name, but Matt insists that he wasn’t lying. He can tell from the heartbeat. Obviously. Claire asks what his plans are. 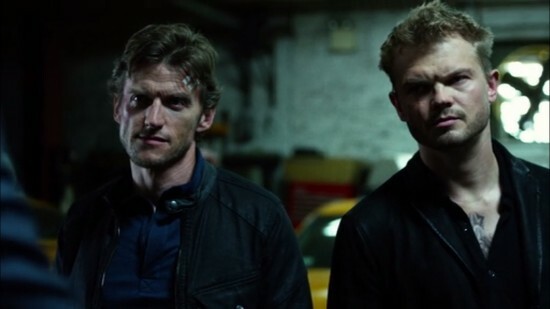 Matt says he’s going to go out and find out who Fisk is, talking to everyone he can get his hands on. We’re taken to an underground workshop where people are making fake taxis and speaking in Russian. Wesley tells the Russian Bros that Madame Gao and Mr. Nobu are disappointed in the quality of the Russians’ product. They’ve been talking behind the Russians’ backs, and they’re concerned that the Russians can’t handle one man running around in in a mask. The employer--that’s Mr. Fisk--has agreed to help return the Russians to get back in business. He wants to take over entirely. Wesley, diplomatic as always, tells them to talk over it with each other and that they’ll be in touch. 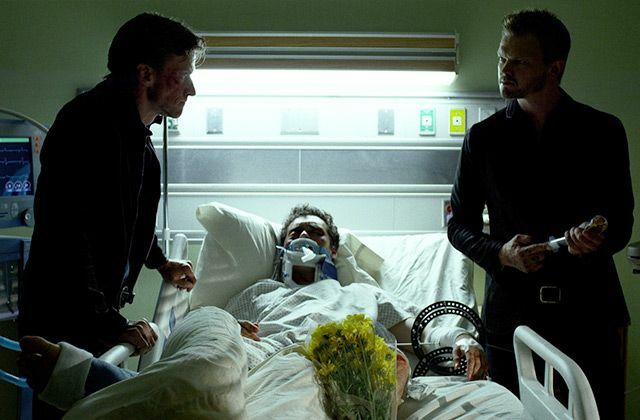 Vladimir and Anatoly talk about reaching out to a man named Piotr for help with their operation, despite the threat of Fisk. They decide that they need to figure out who the man in the black mask is, and they mention that a man named Semyon might know something, but he sleeps like the dead. We then jump to a new scene. Karen is meeting with Ben (my favorite) at a diner, saying that he’s heard the story before--company files for bankruptcy, then restructures under a new name. Karen reminds him that this isn’t like any other time--they killed Daniel Fisher and they tried to kill her. Ben is dubious, bringing up the preposterous idea that she was saved by a man in a black mask. Karen asks if he thinks Rance really hung himself in jail or if it was a set up. Ben continues to tell Karen she shouldn’t get involved, listing off all the people who worked with her that are dead. Ben says she’s lucky to be alive and that she should move on from looking into this case. Karen insists that this can’t just all go away; that there has to be a trail if the construction company is brick and mortar. Ben thanks her for the coffee and decides to leave because her sources aren’t credible enough. He hints at knowing about Karen’s “past activities.” Karen said she’s done her research on him--he’s done amazing things like bringing down the Italian mob. Karen asks him what happened to that reporter, the one who did amazing things. One of the brothers is nervous; he doesn’t want to go back to prison for doing this. His brother convinces him to go along with the plan and he stabs a needle full of epinephrine into Semyon’s chest. They wait, unsure if it worked, but Semyon suddenly comes out of his coma and they pull his breathing tube out. We realize that he’s the guy that Matt threw off the roof in Cut Man, and that's why they wanted him to wake up. He says “the devil” is what did this to him. He tells them about a woman (probably Claire), then whispers something else before he (presumably) dies. Some men come to Claire’s apartment and look around, then see Santino (the kid from Cut Man) in the doorway. They exchange a round of “Holas” before the scene ends. Cut to Fisk and Wesley in the car. They discuss how Anatoly might be their way in; how he’s quieter than his brother. Fisk wants to handle it quietly and asks how they’re doing on the timeline. Wesley says they’re doing well on the timeline, if they can deal with the Russians. Wesley asked about the masked idiot. Fisk says he’ll find another solution if the brothers can’t handle it. Wilson goes to get out of the car and Wesley follows, but Fisk tells him he needs to tend to this alone. Where could Fisk possibly be going? Fisk wanted to thank her for it personally. He fumbles through the conversation until he asks if she wanted to join him for dinner. She can’t, because she’s working tonight. Fisk starts to leave, but the woman calls him back and introduces herself… her name is Vanessa. She also says she’s partial to Italian food. Wilson introduces himself to her, but stutters over it, which is kind of adorable. I try to remember that he's evil at this point. Claire’s still miserable at the cat-infested apartment. She hears a noise in her apartment and pulls a phone from her purse, ready to call Matt. She brushes it off as nothing, but the viewers know better because as she turns away, there’s a shadow at her window. Elsewhere, Matt and Foggy walk out of a building. Foggy notifies Matt when they should cross the street, and Matt holds onto Foggy’s arm. It’s really adorable. Bros for life. After a particularly ridiculous case, Foggy’s lamenting his decision to be a lawyer and wishes he could be carving his own corned beef as a butcher. Matt: “I don’t think they use fax machines anymore. He also laments that he didn’t go to work for Landman and Zack, another law firm--despite the fact that, as Matt points out, Foggy hated interning there. Matt insists they’re doing good there and that they’re making a difference. Just then, Matt’s phone starts ringing, and this phone is clearly something Foggy doesn't know about. Matt says he’ll see Foggy tomorrow, then puts his attention on his phone. It’s Claire, and she’s not answering. On the other line we see her struggling to reach her phone as someone tries to grab it. Matt runs to her aid, tossing his cane in an alley and scaling a building in full business attire. (My tiny son is so sacrificial!) When he gets there, she isn’t there. He throws a chair, angry he couldn’t get to her sooner and probably that his actions have led to her being captured. He goes to the window and listens to all the sounds of the city, trying to zero in on just one. He finds it: a man speaking Russian. They’re putting Claire into the back of a taxi (I knew the fake taxi place was a bad idea). Matt runs after them but apparently loses the trail. We then return to Karen, who’s sitting in at an auction. She hears them giving away office supplies from Union Allied Construction, LLC. Karen sketches the people who are bidding. Behind her, Ben suddenly materializes sits down and warns her that this is how she gets caught. Ben points out two people that are suspicious because they aren’t bidding either. Ben tells her she needs to bid on something so not to appear conspicuous. She doesn’t have any money, but he doesn’t leave room for argument and says to meet him at the diner when she’s done. Cut to the taxi place, where the taxi holding Claire is pulling in. She’s got blood on her shirt and duct tape on her legs and mouth and hands. She fights them as they try to get her out of the back. Santino is in the hall of Claire's apartment building, and Matt finds him. 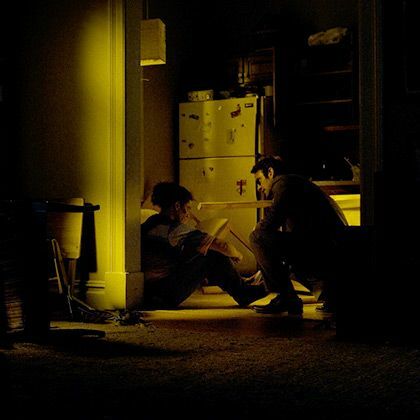 Matt speaks Spanish, so he reaches out to the boy, telling him that Claire has been taken by the men and that he heard them say Santino’s name. He asks for help, but Santino doesn’t know much. 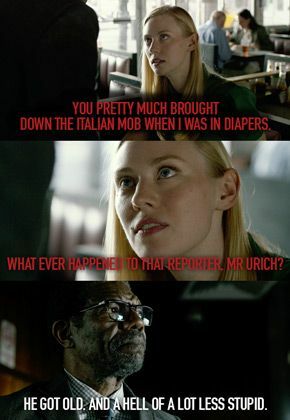 What he does know is that the Russian men took Santino up to the roof and tortured Claire’s location out of them. He doesn’t know where they took Claire. Matt continues, asking if Santino saw anything that could help. He says he saw them get into a taxi: Veles Taxi. Matt runs off, grateful for this lead. At the restaurant, Fisk and Vanessa are out on their date. Wine is poured; it’s a fancy venue. Fisk is being a bit awkward. Preoccupied being evil, of course! The conversation then takes a turn to deeper topics. Vanessa smiles, then toasts to a better place. 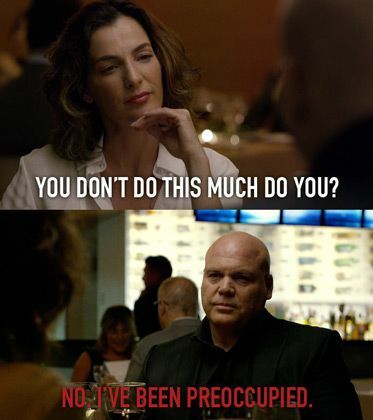 This scene ends, but it’s an amazing look into Fisk’s humanity and relatable side. He also says all he wants is to make this city a better place, which echoes Matt's wishes as well. I love the morality on this show. Fisk and Matt aren’t all that different. They both want to make the city a better place. However, their methods on doing so are where they differ. Meanwhile, Claire’s being beat up by the Russians because she won’t give them the information they want. They want to know who the man in the black mask is. They shatter the window of the taxi. 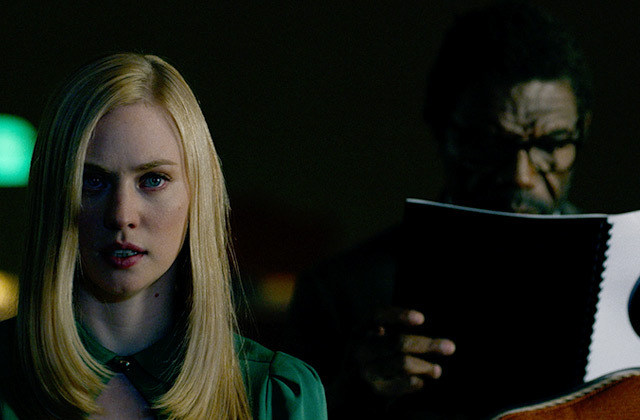 Claire won’t give up the information, but they aren’t allowed to kill her until they get his name. The man threatens her further, threatening to break her into pieces. Then all the lights go out in the place. Matt bangs on metal all over the building to confuse them on where he’s at, which gives time to Claire to slowly start to slip away. Chaos ensues as Matt attacks, taking their guns and even causing some of them to shoot at each other. Claire stays low to the ground. Matt bangs on more metal and the guys are on high alert. Matt clearly has the advantage here. Claire gets her hands free from the duct tape. Matt kills one man with a crowbar. 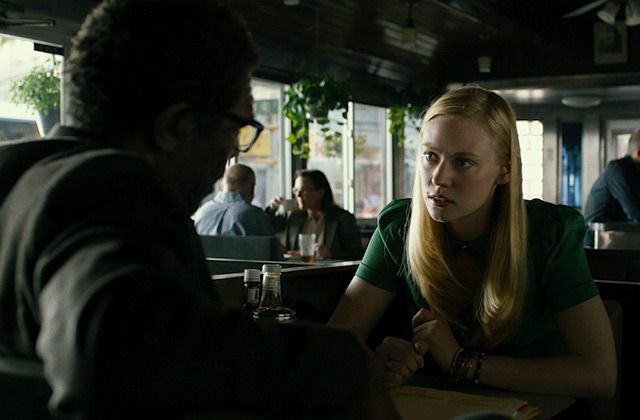 A man catches Claire and attempts to use her as a hostage. He threatens to shoot her. Matt attacks directly and twists his arm. Matt’s gearing up to do something about the man he’s got, but Claire knocks the man out with the same baseball bat they used on her, then starts to cry. Matt holds her close and comforts her as she sobs. Karen heads to the diner to meet Ben after the auction. She bid on some office equipment for $3,500 and charged it to the law firm… and probably will be fired. Ben says it beats the alternative (dying). She asks how he knew she was gonna be there. Ben says he wasn’t looking for her, he was investigating the case for himself. Ben agrees to help Karen expose Union Allied as long as she keeps it an absolute secret. He tells her to sign the agreement from the Union Allied lawyer, which means she can never talk publicly about it. The loophole is that Ben isn’t signing it, so he can talk publicly about it. We see the carnage from Matt’s attack as the Russian Brothers come back. They get a call saying that Fisk has come out of hiding. Vladimir is hesitant, but Anatoly says he’ll go and try to appeal to Fisk to help them out. The other brother agrees to this. We see Fisk at the restaurant, towards the end of his date with Vanessa. They banter back and forth a bit and decide to split a dessert. Anatoly shows up at the restaurant, despite Wesley’s best attempts to keep him out. Fisk starts to leave just as Anatoly tries to say they’ve accepted his offer, which confuses Vanessa. Fisk leaves and tells Wesley to put Anatoly in a car. Let’s pay a visit to Foggy and Karen, who are in the Nelson & Murdock office. Karen shows him the fax machine she bought. She tries to apologize and hopes he isn’t mad, and Foggy smiles and tells Karen his mom wanted him to be a butcher. Suddenly we’re back to Matt’s apartment, where he’s stitching Claire up and bandaging her wounds now. It’s reminiscent of when he bandaged his dad up in Cut Man. Matt apologizes for getting Claire into this and putting her at risk. Claire says it was her choice for pulling him out of the dumpster--which Matt says she did because she’s a good person. He feels guilty she almost got killed because of him. She wants to know it’s worth it and if Matt has an end game, a plan, a way to win. Matt doesn’t have one. Claire says it’s more complicated now. Matt’s face twists sadly as he says that no matter what he does he’s making things worse. Claire reminds him of the boy he saved from the Russians and everyone else he’s helped. Matt still can’t shake the guilt, so Claire tells him to feel her heart and puts his hand on her chest. She asks what it’s telling him. He corrects her and tells her his name is Matthew. Fisk walks Vanessa home and he asks if he will see her again. Vanessa is reluctant about it because she usually doesn’t date customers. Fisk offers to return the painting so he wouldn’t be a customer anymore, but Vanessa shuts him down. She doesn’t want gestures--she went out with him because there was something different about him. Now, she’s not sure if that’s a good thing. Fisk apologizes that the night took a weird turn (worst first date ever). He tells her how much he enjoyed their time together, but says that if she doesn’t feel the same she can tell him and she’ll never see him again. Vanessa hesitates, then says she doesn’t know how she feels. Then she goes inside, leaving Fisk alone on the sidewalk. It looks like he’s trying not to cry. His phone rings. It’s Fisk, who wants to have a word with Anatoly. Fisk opens the door two seconds later, his face full of rage. He pulls Anatoly out of the car and throws him on the ground. They punch each other. Anatoly pulls out a knife and cuts Fisk. Fisk pins him against the car and breaks his arm, then says he’s angry that he embarrassed him in front of her. He beats him up while Wesley sits inside. Anatoly is weakened and appeals to Wesley for help, but he gets none. Fisk knocks him out, sets him up outside the car, and starts slamming the car door into his head while Wesley looks on with a nonplussed expression. He bashes until his head is completely destroyed--what we do see of it is disgusting. This is not a pleasant show, kids. When it’s over, Fisk is breathing heavily with a menacing look towards the camera, and for all we’ve seen of his human side, we know that he is not a nice guy. Before the episode ends, he delivers a few chilling lines. Fisk says to send the remains to Anatoly’s brother. Have you seen In the Blood? What did you think of it?